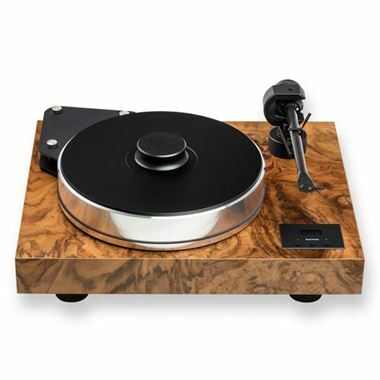 The Project Xtension 10 Turntable is available as a special deal with or without the Ortofon Cadenza Red Cartridge (worth £875), see options above. Call for other cartridge options. This turntable is also available with up to 2 years Interest Free Credit from Vickers HiFi. The Xtension 10 incorporates all of Pro-Ject's 20 years experience in turntable design. The chassis is made from MDF filled with metal sand, which gives a high mass and is non-resonant. But in addition the turntable also uses magnetic feet, which decouple the main plinth from its base. The result of this combination is a merging of the influential 'mass loaded' and 'floating turntable' design principles. Instead of the old-standard adoption of pure metal for a main platter, Pro-Ject researched and uncovered a perfect alloy material, which has then be damped on the inner side with Sorbothane®. Taking this base structure, they've then glued recycled Vinyl records to the top (which act as a perfect mat) and baked this 'sandwich' before precision balancing it. The Xtension 10 subsequently benefits from a wonderfully resonance-free, heavy platter, that runs ultra-silently on an inverted ceramic ball-bearing, with magnetic suspension. The base of the included Pro-Ject 10cc Evolution Tonearm also benefits from 'high-mass' technologies, and is isolated from the main board by a sheet of Sorbothane®. To use this tonearm with a wide range of top quality phono cartridges, from 4 to 14g, it comes with a set of 4 different Sorbothane®- damped counterweights. Finally, the Xtension 10 is also supplied with a beautiful dustcover with adjustable hinges, and is available in three high-gloss lacquer finishes.